1Simon Fraser Univ., 2Shenzhen VisuCA Key Lab/SIAT, 3HPCL, Natl. Univ. of Defense Tech., 4Tev Aviv Univ. 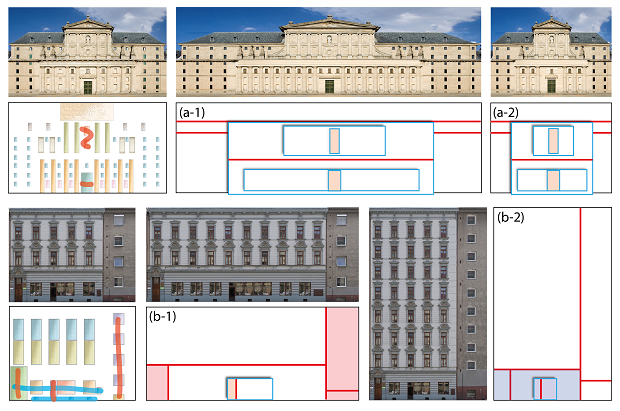 Figure 1: Symmetry-driven structural analysis of an irregular facade (a) results in a hierarchical decomposition (b) into regular grids. Our analysis introduces layering (b), going beyond flat segmentation via splits (c) and allowing more compact and natural structural representations. The resulting hierarchical model of facades enables applications such as structural editing (d) and retargeting (e). We present an algorithm for hierarchical and layered analysis of irregular facades, seeking a high-level understanding of facade structures. By introducing layering into the analysis, we no longer view a facade as a flat structure, but allow it to be structurally separated into depth layers, enabling more compact and natural interpretations of building facades. Computationally, we perform a symmetry-driven search for an optimal hierarchical decomposition defined by split and layering operations applied to an input facade. The objective is symmetry maximization, i.e., to maximize the sum of symmetry of the substructures resulting from recursive decomposition. To this end, we propose a novel integral symmetry measure, which behaves well at both ends of the symmetry spectrum by accounting for all partial symmetries in a discrete structure. Our analysis results in a structural representation, which can be utilized for structural editing and exploration of building facades. Figure 2: Overview of facade analysis and synthesis. Input to the analysis is a box abstraction, with boxes having the same color representing repeated basic elements of a facade, e.g., a window. Our algorithm computes an optimal hierarchical binary decomposition (b: top) based on splitting (dark line) and layering (shadowy box) of facade structures enclosed by the boxes. The analysis result defines a structural representation (b: bottom), which can be altered (c: top) to produce interesting structural variations (c: bottom). Figure 3: Box abstraction and decomposition candidates. A facade image (a) is converted into a box abstraction (b), where the boxes represent the atomic elements. Element groups (c) formed by repeated elements (boxes in same color) in rectangular grids are identified. The four groups on the left are incomplete and those on the right are complete. Decomposition candidates are selected (d) and incomplete element groups undergo structural completion (partially revealed by slightly moving the top layer box to the side). 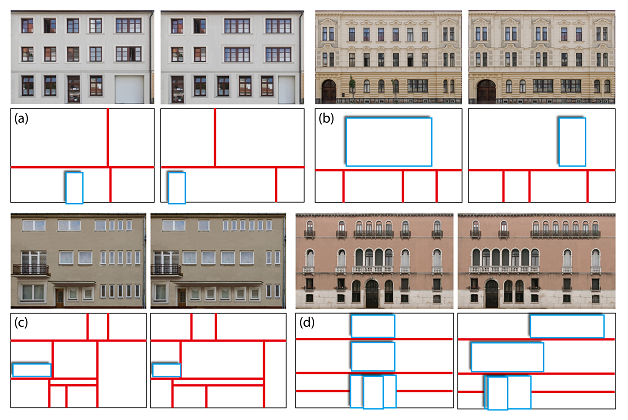 Figure 4: Analysis results on real-world irregular facades (left). The right most image in each set is a collapsed view of the resulting structural representation. The middle sequence shows the optimal hierarchical decomposition obtained. A current split line is shown in red and layered box in light blue border; both colors turn to black in the next level of the hierarchy. 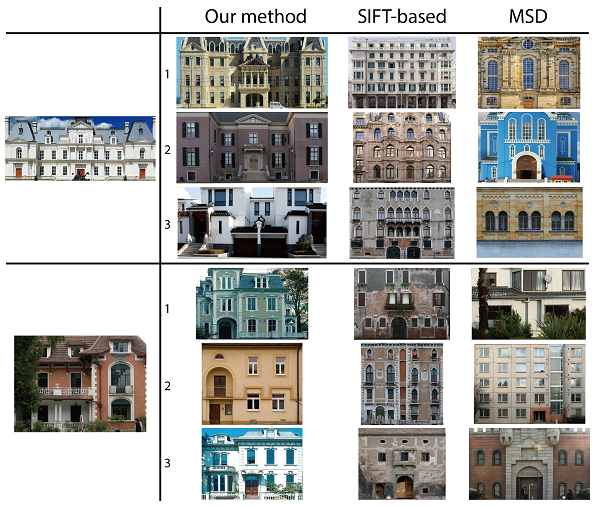 Figure 5: Some facade editing results. Alteration of structural representations and instantiated facade images are both shown. Figure 6: Retargeting results with locking constraints (blue scribble: vertical locking; red scribble: horizontal locking). Figure 7: Facade retrieval results on two queries using three different methods. Top three returns are displayed. Note that our treeto- tree distance is invariant to left-right switching. Figure 8: A unnatural split (b) from our analysis on an irregular facade (a). A more natural split (c) can be obtained by placing more emphasis on horizontal symmetry or altering the input (d). We would like to thank all the reviewers for their valuable comments and feedback. Thanks should also go to Yangyan Li and Niloy Mitra for their helpful discussions. This work is supported in part by grants from NSERC Canada (611370), NSFC China (61202333, 61025012 and 61232011), Guangdong Sci. and Tech. Program (2011B050200007), Shenzhen Sci. and Inno. Program (CXB201104220029A and KC2012JSJS0019A), CPSF (2012M520392), and the Israel Science Foundation.